I love a cake that is not pretentious. One that does not demand some sort of special event such as a birthday, nor hours spent frosting and decorating. Just a simple, yet elegant treat to bake for almost any occasion. 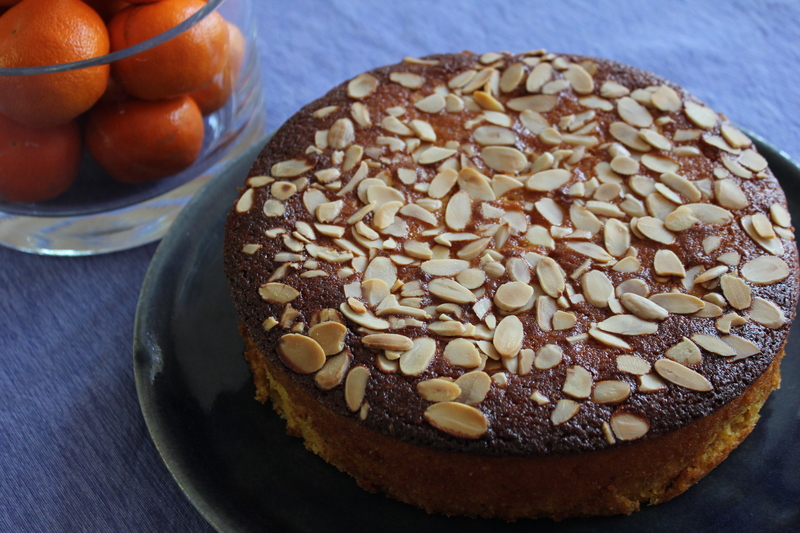 This Flourless Orange and Almond Cake is exactly that cake. 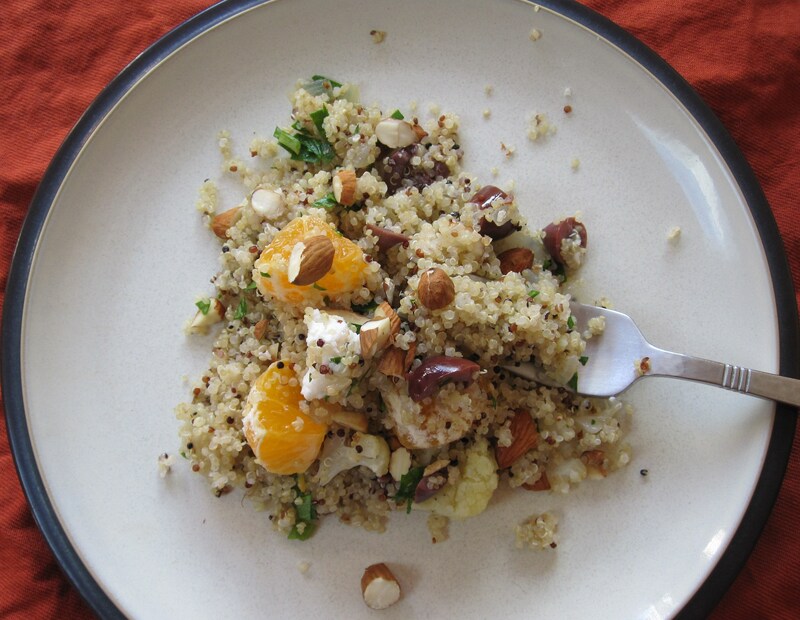 Oranges, cooked and pureed, mix with almond meal, eggs, and sugar to create an incredibly moist and fragrant dessert. The toasted almonds give the caramelized top just a bit of crunch. The cake is great even a day later, so do not be afraid to make it in advance. There is sense and order to the world. Need proof? 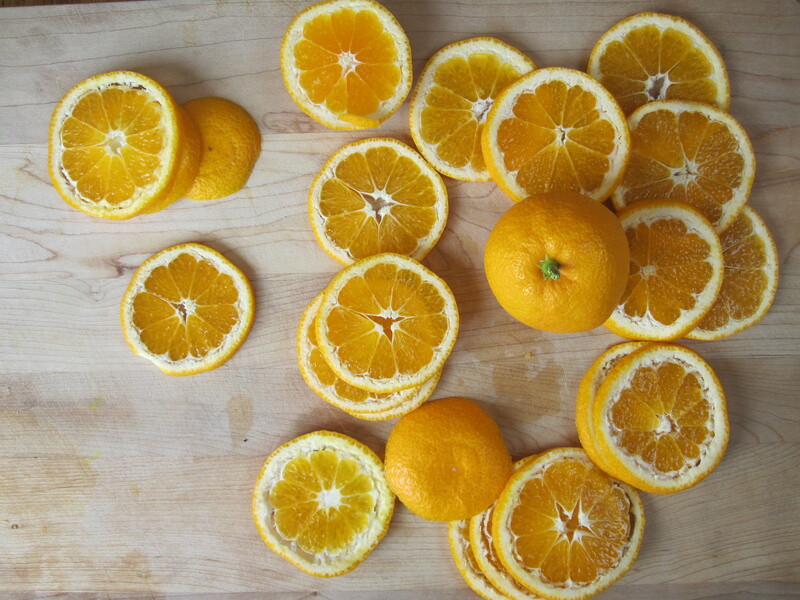 The ripening of winter citrus. It is the darkest days of the year that bring us the brightly colored, terrifically acidic oranges and lemons, limes and grapefruit, or at my house… buckets upon buckets of satsuma mandarins. Not familiar with satsumas? They are a small orange with a sweet tart bite. They are similar to the other easy-peel small citrus, such as clementines, that are sold in boxes at all the grocery stores right now. In fact, this recipe could easily be used with those little cuties or even a standard orange variety. 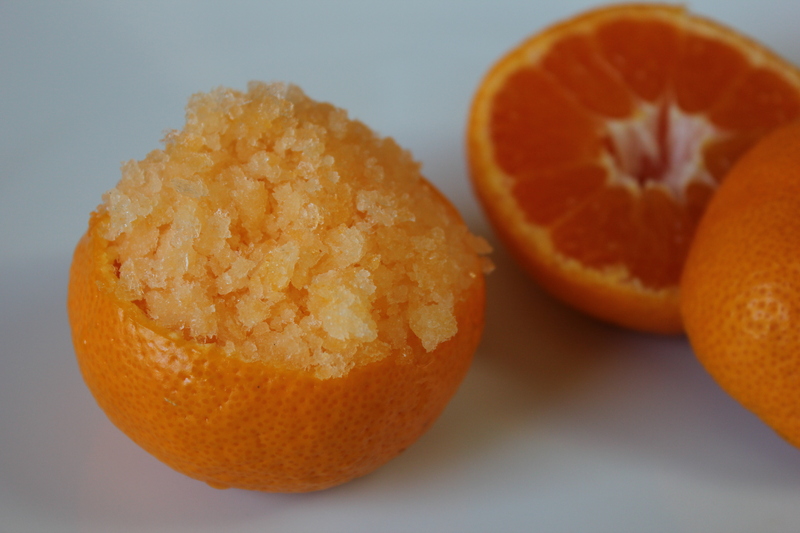 Satsuma Granita is the ultimate anti-winter. Fresh-squeezed satsuma juice is mixed with a touch of lemon juice and bit of ginger-infused simple syrup. The mixture is frozen and fluffed, then gently packed back into the peels of the satsumas. Fun to look at, even more fun to eat, these balls of cool orangey ice will make you forget it is the middle of winter. As my kids said, “They are like snow cones, only BETTER!” They are also remarkably easy to make. If you happen to have young children underfoot that have run out of engaging indoor activities, by all means put them to work! My daughter happily monkeyed up the tree to pick the fruit before juicing the lug of fruit. What delicious fun! This has been a cleansing week. No work for me and no school for the kids means that we had a lot (too much?) time around the house. Complications outside our control kept us from adventuring in the way we might otherwise. The upside is that the floors are swept, the drawers organized, and the piles of recipes are neatly filed away. This house is clean. Most importantly, the last of the holiday cookies and sweets have happily made their way (on way or another) into a better place, out of my reach. I mean, who really wants to be looking at a cookie on January 5th? Not me. 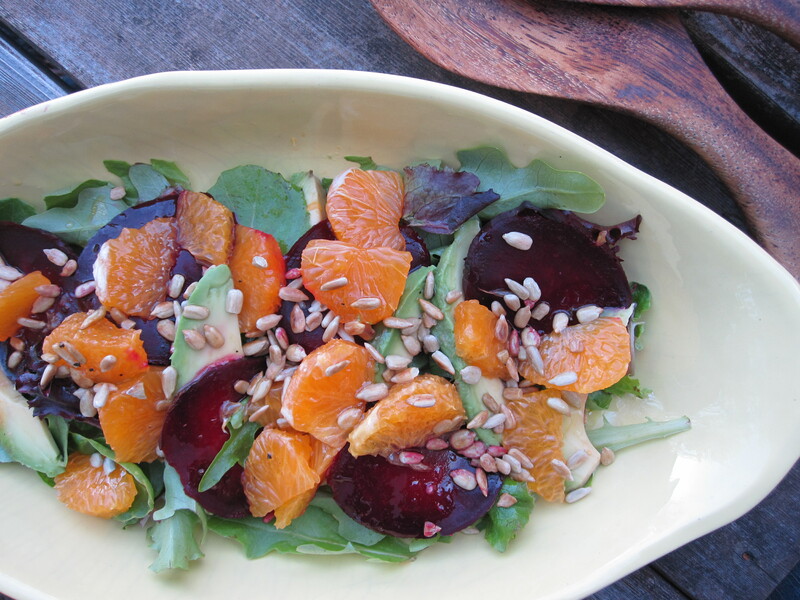 Orange and Beet Winter Salad pairs bright juicy orange with paper thin slices of roasted beet, creamy avocado, and crunchy toasted sunflower seeds. The greens are an accent instead of the foundation of this dish. Eat this now and enjoy it, I know I am. This is definitely one of my favorite winter cakes. Every year, I watch our satsumas ripen and dream of this dessert. I invent reasons to gather with friends, just so I can share this cake. I am not to be trusted with this buttery, tangy, orange vanilla cake without many mouths with which to compete. It is that good. 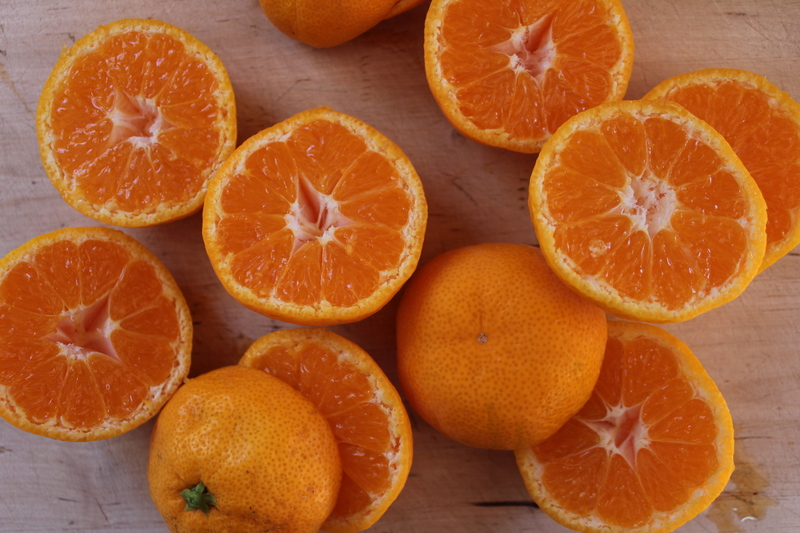 Make it quick, while satsuma mandarins are in peak season! This cake would be great with any tangerine or mandarin. We have an overabundance of satsumas so that is what I use. Upside down cakes are a new thing for me. Nothing against the legendary pineapple upside-down cake, but it has never really captured my attention. To be honest, I have a hard time veering from chocolate when choosing a dessert to make, especially in the winter. This cake is so incredibly flavorful, moist, and buttery that I really don’t miss the cocoa (If someone has an idea of how to make this better by adding chocolate, please let me know. Though as is, I think it may be perfect.) 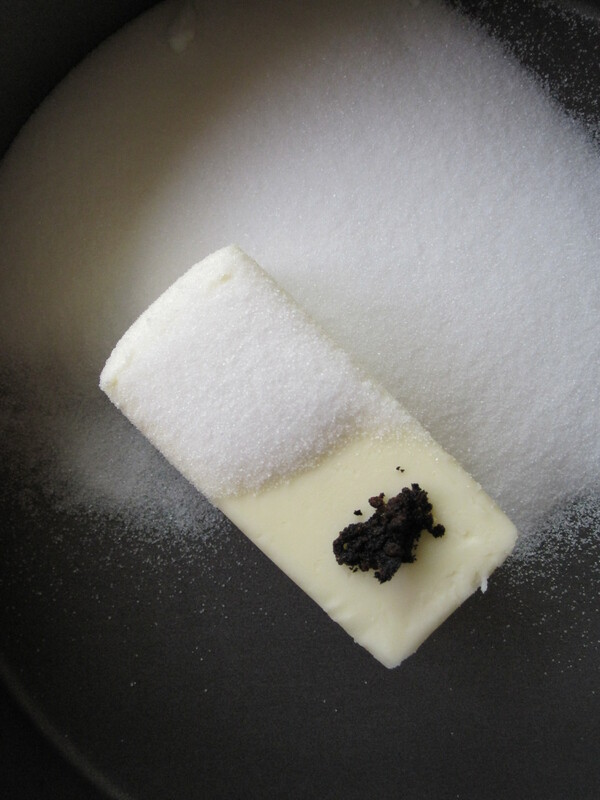 Using real vanilla scraped from the pod infuses the cake with a serious dose of deliciousness. 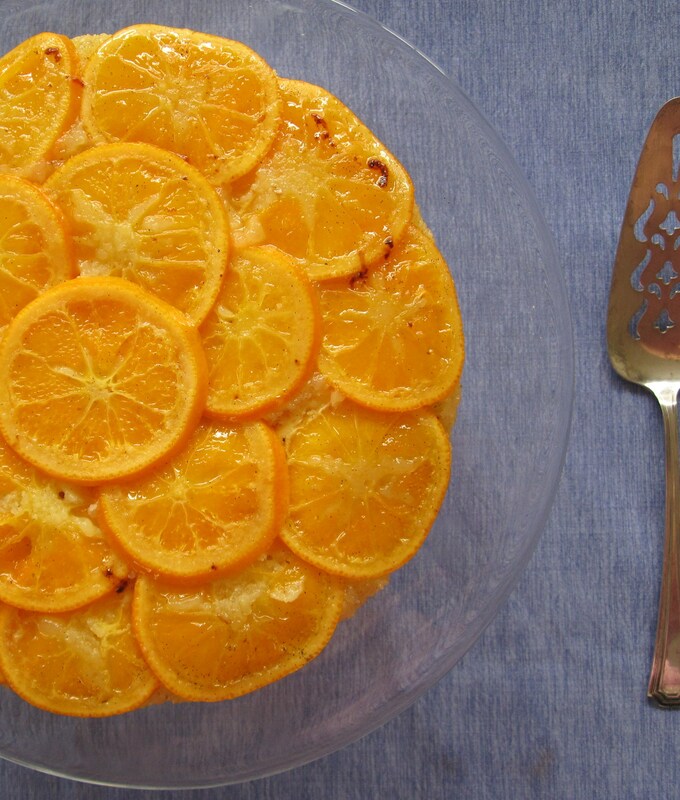 To make this cake, start by thinly slicing the satsumas. It is easiest to use a mandoline, but if you don’t have one you can use a knife. Be sure to make the slices as even as possible. Blanch the satsuma slices and then dry on a cloth. 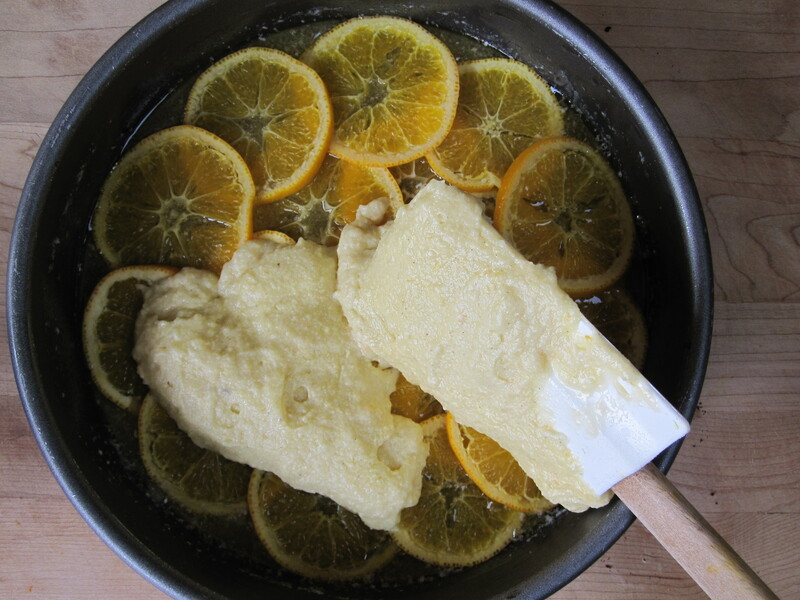 Melt the butter, vanilla, and part of the sugar in the cake pan, then arrange the satsuma slices. 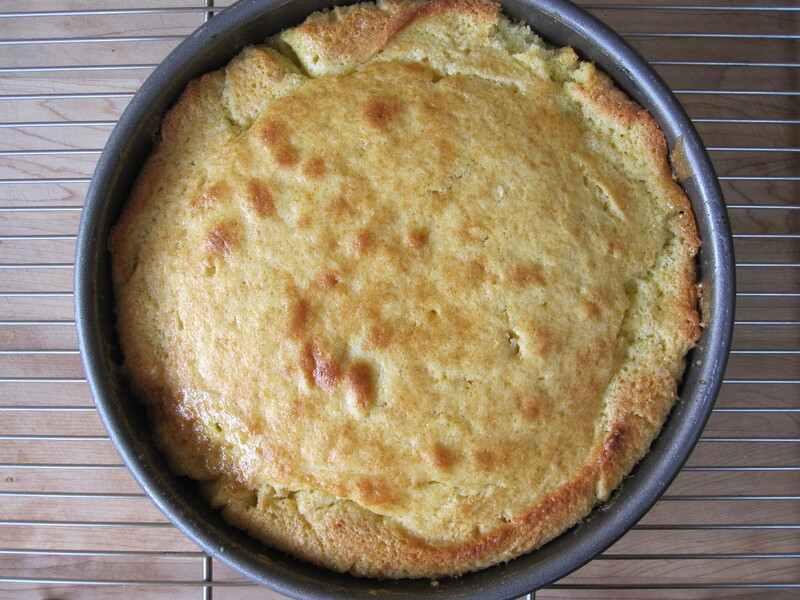 Gently layer on the cake batter and bake in the oven until the top is browned. This batter is fabulous with other toppings as well. I recently made a cranberry upside cake with this base and it turned out delicious! This cake is best eaten the day it is made. It is delicious the next day as well, but the top gets a bit moist. Santa gave me my first lesson in eating with the season. Each year, nestled deep in the toe of my gargantuan knit stocking, I would find an orange. First I would be disappointed- all that valuable stocking space used up by something destined for the communal fruit basket! Then I would be perplexed. Why an orange? Sure, I liked oranges, but they were nowhere near my favorite. Why not a juicy peach? Strawberries? Papaya? Sweet watermelon? OK, I understand why Santa couldn’t put a watermelon in my stocking. Still, it never occurred to me that he was simply offering the sweetest treat that winter had to offer. Though we had an orange tree in our backyard, it had not fully dawned on me that oranges are a winter fruit. Vibrant, sweet, and juicy citrus is ripe for the offering right at the time when Santa swings through town.